In the trilogy of The Lord of the Rings films, The Fellowship of the Ring, The Two Towers, and The Return of the King, when tasked to be the bearer of the One Ring that controls all others, Frodo begins a journey that will stretch across Middle-earth. Aragorn, the rightful heir to the thrown, will be his protector along the way as he takes the One Ring to be destroyed in Mount Doom. 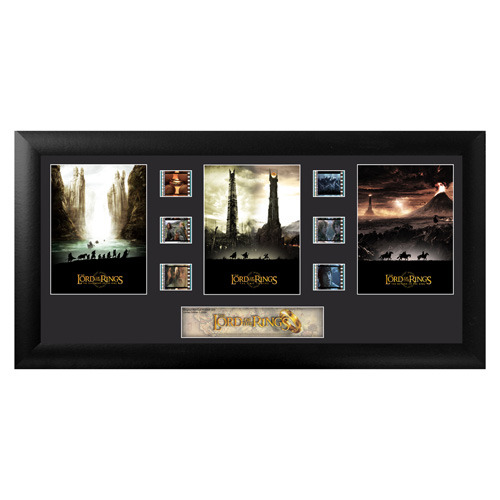 The Lord of the Rings Series 3 Trilogy Film Cell is a limited edition of 2,500 pieces that contains 6 clips of real film, a striking image from each of the three The Lord of the Rings films, and a numbered limited edition name plaque. These elements are double matted and placed within a beautiful black wood frame that measures 20-inches wide x 11-inches tall. Please note: The actual strips of film vary from piece to piece, as they are hand picked from reels of film. We cannot accept requests for specific strips, nor can we accept returns on opened items. The cell strips you receive may be different from those pictured. Ages 15 and up.